We are currently working on a couple of projects where we have employed alternative fencing types, instead of traditional wooden fencing. 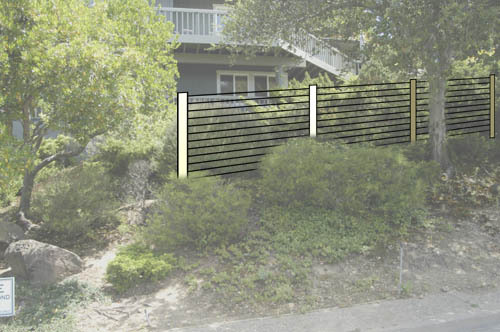 When designing fencing there are several options for detailing, both for wood designs, and for alternatives. These two projects both used wire elements to give a more architectural feel to the design, and to prevent a boxed-in feeling. In the first, we used heavy grade welded wire fence panels framed with wood to create a fence that would act as a trainer for vines. For the other project we used wire cables to prevent deer from entering a property, while still preserving views. The client did not want a fenced in feel, and did not like the aesthetic of a tradition welded wire deer fence or chain link. Vines and shrubs will be used to screen where necessary.